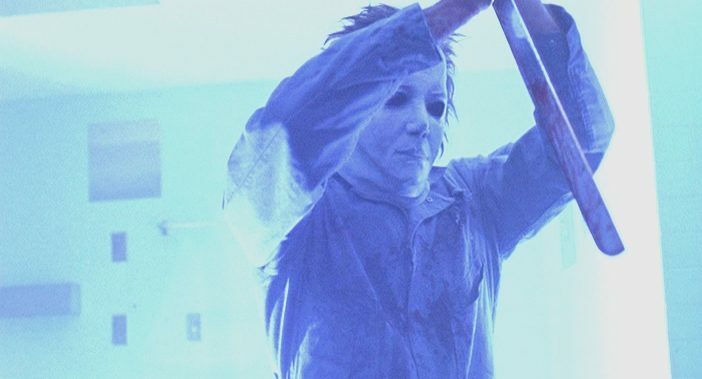 Being named as the new Michael Myers is a huge event that literally shapes much of the future of each performer’s career after taking a stab at the role, but when A. Michael Lerner put on the mask during the infamous studio-mandated reshoots for the sixth film in the Halloween franchise, he had no idea the legacy that he was about to become a part of. I talked to A. Michael Lerner at this past October’s historic H40: Forty Years of Terror Halloween anniversary event in Pasadena, CA., where he was among a total of 19 actors and stuntmen who played Myers throughout all 11 films of the franchise that were in attendance along with over 50 other cast and crew, the largest gathering of its kind in history. Read on for our interview with A. Michael Lerner on stepping behind the most iconic mask in horror movie history, hanging out undercover with fans, and The Curse of Michael Myers. A. Michael Lerner as Michael Myers in ‘Halloween: The Curse of Michael Myers’. Here we are, it’s 40 years after the original Halloween. It’s the most Michael Myers actors ever assembled in one place. How does this feel to you right now? It’s incredible. This is maybe about the fifth convention that I’ve done. I like it. I only do them every other year or every three years or so. I get to see a lot of old friends from the film industry, because I’ve been out of the film industry since 1998. Celebrity for a weekend, and once I leave here I’m just like any other Joe on the street. I had to wear a mask and I had no dialogue, so besides the followers, nobody really knows who I am. So it’s kind of fun for you to come out and be a rock star for a weekend. Yeah, I’m a celebrity for a weekend, and it’s a good feeling. And I get to go back to a normal life, unlike a big name actor who can’t. So maybe wearing that mask was a good thing, because I can still go gamble and drink or go to restaurants or whatever, and not have to worry about getting bothered. So how did you get involved with Halloween 6? I was in the Stuntmen’s Association (of Motion Pictures). They had already filmed it with George Wilbur. George did 4 and 6. And, for whatever reasons, they wanted a new Michael Myers for the added scenes. I went in with probably four other stuntmen actors and tried out for it. They looked at us and the size and everything, and they just picked me out of the group. It wasn’t that big of a deal to me, because to me it was just two more weeks of work. I didn’t even follow the Halloween thing, but once I got the part, I went ahead and studied the films so I knew how to move and all that. And I added my own little flare, like all of them do. Right, everybody adds a little of their own touch. So now that you are part of this legacy, one of the few men in the world that has actually portrayed this character on screen, it’s got to be pretty overwhelming sometimes. It’s pretty cool. The reality of it doesn’t always hit me. Like I said, it was just work for me. One of the funny things for me is I’ll go to a bar or a restaurant, and I’ll be sitting next to somebody, and they’ll have a big Michael Myers tattoo on their arm. Little do they know. So, out of fun, they don’t know who I am, I’ll start talking about the movies and which is their favorite one, but I never really let them know I’m Michael Myers. It’s like an inside thing for me. It’s kind of fun. A lot of people, if I tell them, they’re not going to believe me. Then I have to go through the whole IMDb and pull up pictures and all that. And I’m not really there to – you know what I’m saying. Something like this (Halloween convention) is different. That’s got to be crazy for you to see those tattoos all the time. Or you’ll be flipping through the channels and probably see yourself all the time. I do that on a lot of different movies I’ve done, stunt work as well as acting. And I see my dad (Fred Lerner), being an old stuntman too, so I find a lot of his stuff. He goes way back to the Rawhide days. It’s pretty cool. ‘Halloween’ 2018 Working Title is ‘Night Blade’; Actresses Who Auditioned Revealed?